- a terrifying experience connected with mowing the lawn ("The Lawnmower Man"). To me these show that King was either still searching for his place and establishing his style or he was already good enough to take horror fiction with a pinch of salt. These stories are actually funny rather than scary. There are also other, better ones in the collection. 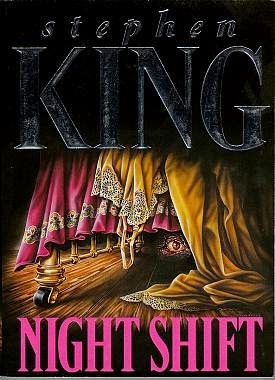 Some are loosely connected with King's other novels, such as "One for the Road" and "Jerusalem's Lot" (references to "Salem's Lot"), or "Night Surf" that takes place around the time of events described in "The Stand". "Children of the Corn" is one of King's most recognizable titles - I even remember seeing references to it in Family Guy. While it also lacks certain polish and has the class-b-horror feel to it, it is still one of the most memorable from the collection. It has this oppressive, dark atmosphere and takes place in well defined American rural setting. "The Woman in the Room" was probably the most powerful one from the whole collection. The protagonist is a man who struggles with the idea of euthanizing his terminally ill mother and helping her escape from the pain she suffers every day. His thoughts and actions are morally ambiguous and it's really hard to judge his deeds.